At Compline on this fourth day of the forefeast of the Nativity we sing, “Let us purify our nous, washing ourselves with the divine Mysteries; let us draw near in soul and body to Bethlehem, that we may behold the fearful dispensation of the birth of the Lord” (Ode Five of the Canon). "Today the Church rejoices, sings and adorns herself. Truly she celebrates the Forefeast of the Nativity of the Savior." 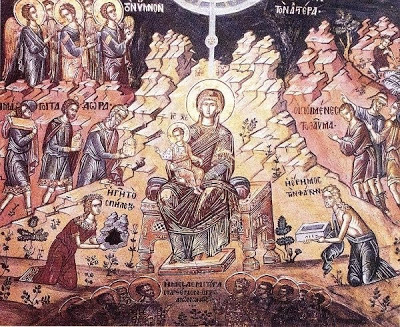 "Christ is drawing near, the Star already shines, the heavenly multitude of the host of spiritual powers bows down". "Shake the sleep of laziness from your eyes, all the faithful, be vigilant in prayer, shun the temptation of the evil one, and with the shepherds behold the glory of Christ who comes to be born". "Let us spurn the passions of the flesh and let us abandon the delights of the world. Let us hold fast to thoughts of the wisdom of God, and let us worthily offer ourselves by our good deeds to the newborn Master". "Faith instead of gold, love instead of myrrh, action instead of incense, let us offer to the Creator, who came for us all".